A thousand bullets on screen and so many enemies running around that its a miracle you can get through the first half of the first level. 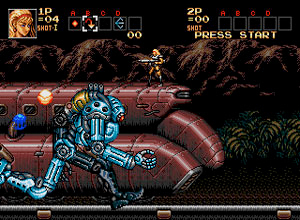 If you know this craziness you have probably played Contra: Hard Corps. Contra is set in the future where a huge crisis has just started and it is up to you to set things right. You will fight so many enemies that at the end you will wonder if anybody could ever keep count. You will fight so many crazy bosses that nothing will ever surprise you again. And you will have to chose your path. That is right, Contra allows you to chose your path to victory and depending on what you chose you will see different places and different levels of craziness. All through the story one of the four heroes you have chosen will have to run, jump, and shoot its way through hoards of enemies, some don’t even make sense. And you can be certain that there will be a boss at the end of each level. If the crazy story and sheer awesomeness isn’t enough, each hero has four types of bullets. Depending on what you pick up as you run around, you will be able to do some crazy things. From flame-throwers to homing missiles, the fun will never run out. But don’t take too long to look at your weapon because at any given moment there will be at least 25 enemies on screen and hundred times as many bullets flying. One hit and you are out. The sheer amount of things flying around make this game a tough one to beat. Unless you cheat. But no one does that, ok!? Anyway, as I was saying, a hard game to beat but it is so crazy and awesome that its just worth it. If you are looking for a crazy shooter where the world is ending all around you and nothing makes sense, Contra is your game. If you cant stand the heat, then don’t play it. 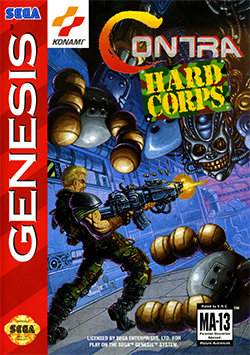 This entry was posted in Classics and tagged contra, contra:hard corps, genesis, hard corps. sega, shoot'em up. Bookmark the permalink.